An undisclosed injury has forced Daniel Straus out of April 4th’s title bout with Bellator featherweight champ Pat Curran (Pictured). “Paddy Mike” now defends his hardware against Shahbulat Shamhalaev. 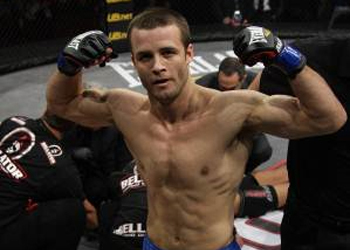 Bellator MMA CEO Bjorn Rebney announced the swap Wednesday afternoon via Twitter. Curran owns a 18-4 professional record, with one of his victories coming over Straus four years ago. Despite the KO finish, Curran knows both have evolved since their initial encounter. Shamhalaev ran through Bellator’s Season 7 Featherweight Tournament, which earned the Russian a crack at the 145-pound crown after Straus. He owns a 12-1-1 professional record and is perfect through three Bellator bouts. Straus earned his shot at the throne by taking Bellator’s Season 6 tourney. No word on where this injury leaves the 28-year-old. Ovation Hall at Revel in Atlantic City, New Jersey hosts the gig. Spike TV will broadcast the night’s featured fights.